I wore this outfit right before the chill in SF started (which was yesterday). I'm so cold now that I wouldn't dare wear this outfit out! I have not gotten over my find in this H&M skirt (last seen and raved about here). I love the color (who doesn't right now?) and the fit. I've said this before and will continue to say this but, the pencil skirt silhouette is without a doubt one of the most feminine and flattering pieces to own. Despite its sophisticated structure, it has an understated sexiness to it at the same time. Not all pencil skirts are created the same however so finding the "right" one is definitely like finding the "right" pair of jeans. You have to try many before finding "the one." Lucky for me, H&M had the right price point, too. Happy Friday! Enjoy the weekend (and stay warm!). amazing pairing- love that denim shirt. you are always gorgeous as usual! Pencil skirts can be tricky…especially if you're on the short side, like me…I always have trouble finding one that hits in the right spot. This is such a great buy from H&M…and a gorgeous color! 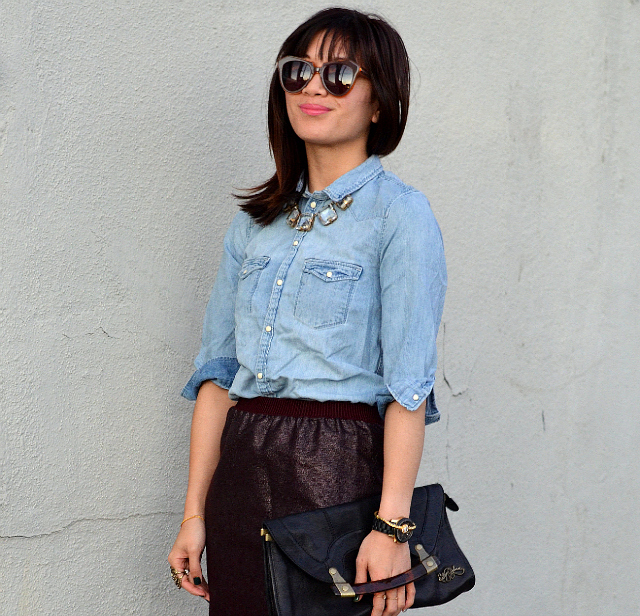 I love this skirt paired with the chambray, you look so pretty! Have a great weekend! i love this outfit and ur smile so cute love it!! Hi dear, I like the luxurious look to your skirt and the colour is beautiful too, well paired with the chic denim shirt and lovely necklace. Such a cute combination! I love how classic it is and still posh! I was just in SF yesterday and realized how cold it was even though it was sunny! I'm really excited for the colder weather since I love sweaters, layering, and boots! Super cute look!! I love the skirt, so adorable! such a great outfit and making chambray adorable! you look like you just stepped out of a jcrew mag! uh-maze! 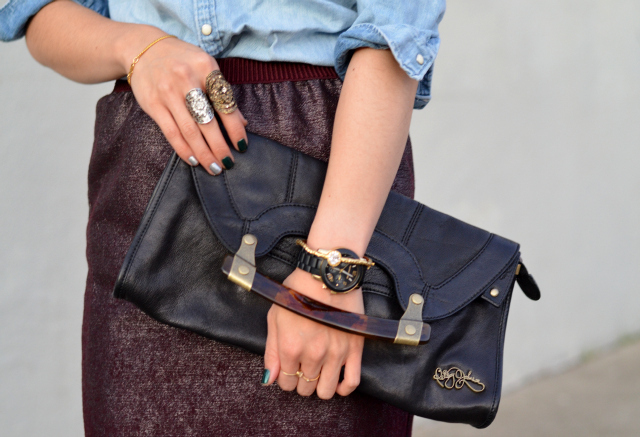 LOVE the denim shirt, and the clutch is so classic and cute! Such a great outfit, you look so pretty!! This is such a great blend of elegance and casual...I love the look and your use of accessories...everything looks effortlessly chic! I agree about the pencil skirt! and i LOVE LOVE LOVE, yep three loves, those shoes! Super lovely outfit, you look amazing! Great look, I love the pencil skirt. And you chambray shirt is H&M kids? I would never think to look in the kids section, but there might some great deals! Nancy, it's a great color and it sparkles! So fab! You are right! Pencil skirts are NOT created equal. I find the fabric has a lot to do with it. Some do not give. LOL Also if it has pockets or not. love, love, love this H&M skirt! I'm in love with that skirt! That color and the sparkles are just perfect. I love that you paired it with a denim shirt. You look stunning! Beautiful outfit! That skirt is amazing! and can't believe you're in the bay area and we have not met yet?! hope to see you at a SF Fashion party soon! p.s. am coveting that skirt now and need to find at local H&M! Nice outfit, I love your necklace!xo. your last couple of outfits were truly amazing! but why cant i fullsize your pictures anymore? now everything is so small, i cant even make out the details! You look so chic in this outfit!! That skirt is amazing and I just love the colour! Your skirt is beautiful! I LOVE the color and the fit :) It looks amazing dressed down with the denim shirt. Chic result! I like your sunnies!